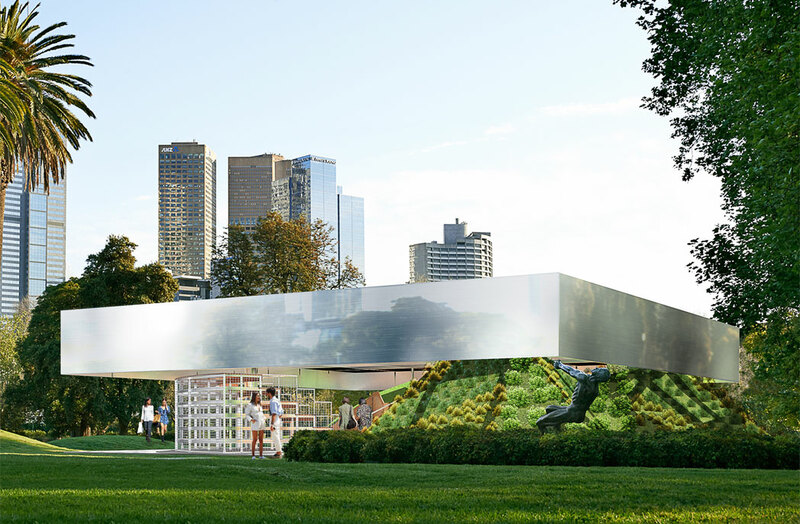 The Naomi Milgrom Foundation has unveiled its 2017 design for the new MPavilion, which was designed by Dutch architects Rem Koolhaas and David Gianotten of Office for Metropolitan Architectures (OMA). Well known for their modern architectural icons, OMA’s MPavilion 2017 design sees a temporary structure that, along with providing space for public debate, design workshops, music and arts events, is itself built to perform. Naomi Milgrom AO, MPavilion founder, says, “OMA’s exciting design engenders a theatre for ideas with Melbourne as its backdrop. MPavilion 2017 will be extremely different to previous years, with a designated yet flexible stage enabling all kinds of cross-pollinated activity. Located in Melbourne’s Queen Victoria Gardens and inspired by the amphitheatres of old, the MPavilion blurs the lines between inside and outside – and between audience and performer – in a skilful yet empathetic manipulation of its surrounding landscape. OMA’s pavilion design seeks not only to employ the qualities of the amphitheatre, but to animate them by creating a flexible civic space that can function as a stage, an auditorium or even a playground. The circular amphitheatre will be bordered by a hill of indigenous plants and covered by a huge floating roof structure. It is shaped by two-tiered grandstands, one fixed, the other movable. The rotating grandstand allows interaction from all angles and for the pavilion to open up to the garden and broader cityscape. Overhead, a two-metre-deep gridded, machine-like canopy with a protective translucent roof will provide lighting and technology for the series of free public events. Comprising static and dynamic elements, the pavilion allows for multiple configurations that can generate unexpected programming, echoing the ideals of the typology of the amphitheatre. In a first for MPavilion, the program will open up to design industry professionals and students through a call for proposals to contribute to the events and activities during the season between 3 October 2017 and 4 February 2018. MPavilion will open free to the public on 3 October 2017 until 4 February 2018. Read about how MPavilion 2016 will be relocated to the Melbourne Zoo, over here.